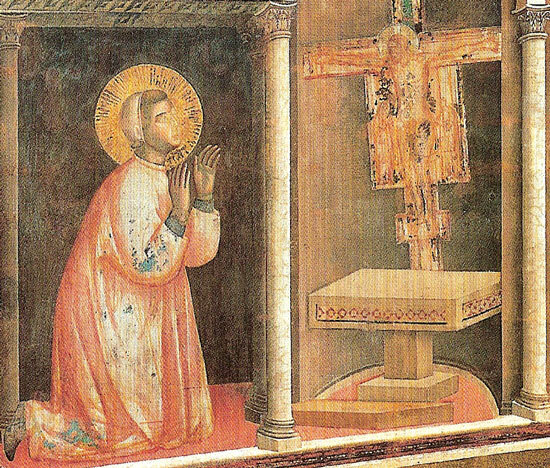 Initially, Saint Francis understood that he was to repair the material fabric of San Damiano and of other small churches around Assisi. He set about collecting stones, repairing walls, and beautifying the churches he repaired. The whole life of Saint Francis was, I think, a deepening of the initial call to reparation. When Saint Francis preached, it was by his words that he repaired the Church. When he taught his disciples the way of life that was to be theirs, it was by the simplicity of his reliance on the promises of the Gospel that he repaired the Church. When he nursed lepers, visited the sick, and gave food to the hungry, it was by his works of mercy that he repaired the Church. When Saint Francis spent long night watches in prayer, repeating over and over again, Deus meus et omnia, he was, by this prayer, repairing the Church. Saint Francis’ extraordinary care and reverence for the Body of Christ in the Most Holy Sacrament of the Altar was, in effect, a continuous act of reparation, one with his love for the Mystical Body of Christ, even in the most disfigured and broken of His members. O humble sublimity! O sublime humility! that the Lord of the universe, God and the Son of God, so humbles Himself that for our salvation He hides Himself under a morsel of bread. Consider, brothers, the humility of God and pour out your hearts before Him, and be ye humbled that ye may be exalted by Him. Do not therefore keep back anything for yourselves that He may receive you entirely who gives Himself up entirely to you. He who would repair the Church will do it most efficaciously by humbling himself before the Son of God who “so humbles Himself that for our salvation He hides Himself under a morsel of bread” and by keeping back nothing for himself, in order to be received entirely by Him who, in this Most Holy Sacrament, gives Himself up entirely to the one who feeds upon Him. 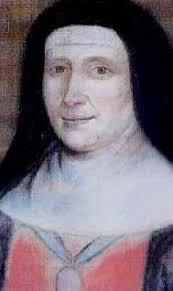 In this text, the Seraphic Patriarch expresses what, four hundred years later, the Benedictine Mother Mectilde de Bar (a sometime daughter of Saint Francis as a religious of the Order of the Annonciade from 1631 until 1639) would place at the heart of her own doctrine of reparation. Like Saint Francis, Mother Mectilde falls prostrate before the humility of the Host; she contemplates and adores the Son of God who, for our salvation, hides Himself under a morsel of bread. For Mother Mectilde, as for Saint Francis, there is but one response worthy of the self–emptying of the Son of God in the Most Holy Sacrament; it is a movement of profound humiliation, a kind of prostration of the soul that seeks, however imperfectly, to meet the humility of God in an act of self–emptying adoration. One who would understand the nature of the adoration and reparation practiced and taught by Mother Mectilde, does well to ponder the words of Saint Francis: “Do not therefore keep back anything for yourselves that He may receive you entirely who gives Himself up entirely to you.” It is in a great nakedness of spirit, in utter spiritual poverty and deep humility — Mother Mectilde calls this state anéantissement, that is, exinanition, or ennothingment — that one begins to correspond to God who, in the Host, gives Himself to the soul in a state of unfathomable poverty and self–emptying condescension. The self–emptying adoration, to which the contemplation of God “hidden under a morsel of bread” brought both Saint Francis and Mother Mectilde, became, at the same time, an act of reparation. There comes a moment in adoration of the Most Blessed Sacrament when one senses that nothing makes sense but to surrender to the divine operations of the Host. In this moment God becomes the Repairer, and the soul, stripped of all her pretensions and defences, enters into a state of reparation not by acting, but by allowing the Host to repair her. This is, at the deepest level, the work of reparation. The repairing of the Church begins and goes forward whenever and wherever even one soul consents to being repaired by the action of God upon her and in her. The whole Body of Christ is cleansed, healed, strengthened, and restored when even the littlest member of the Body, having exhausted all the human means at his disposal, adores the Host and allows the Host to repair him in ways that are as mysterious and imperceptible as they are divine and transforming. The Church will be repaired, in our own day, as in the 13th and 17th centuries, one soul at a time. 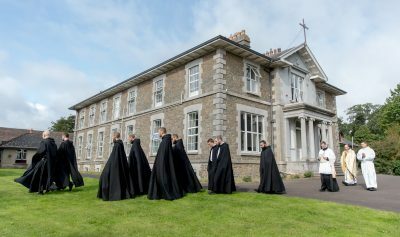 “Do not therefore keep back anything for yourselves that He may receive you entirely who gives Himself up entirely to you” (Saint Francis, Letter to All the Friars).